byPeterandPauls.com owners and partners and David Duncan House staff celebrate re-opening of iconic Toronto restaurant. More than 300 friends, family members, colleagues, business associates, media members and City of Toronto officials gathered at David Duncan House last week to celebrate byPeterandPauls.com‘s re-launch of the iconic Toronto restaurant. Guests at the indoor/outdoor celebration enjoyed a live raw bar, charcuterie and traditional favourites like Cherries Jubilee and table-side Caesar salad, a Duncan House tradition. They also got a first look at the renovated property, including its five newly-designed private spaces. At the celebration, Councillor Michael Thompson, chair of the City of Toronto’s Economic Development Committee, presented byPeterandPauls.com CEO Peter Eliopolous and partners of David Duncan House with an official City of Toronto scroll honouring the company’s investment in the restaurant and the local community. 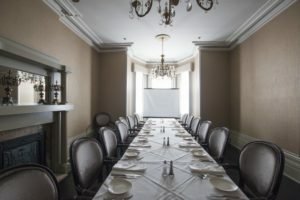 Thompson, who is also the councillor for Scarborough Centre, said the restaurant had a long history in the community and that he knew by PeterandPauls.com, which acquired the restaurant in November 2017, would maintain that legacy and provide an elevated, quality dining experience for many years to come. 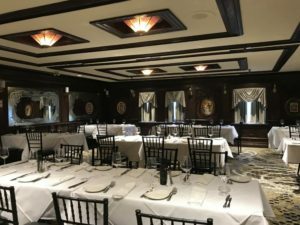 After accepting the scroll, Eliopolous thanked his partners and the restaurant’s staff for their dedication to the property and its revitalization. 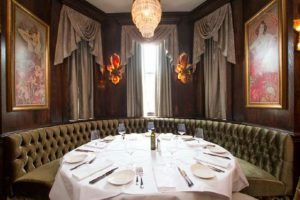 He also explained that his initial plan was to completely modernize the design and menu of the restaurant, but after dining there several times he decided keeping the restaurant’s elegant old-school steak house charm was essential. 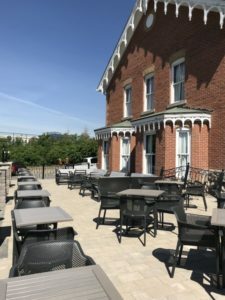 As a result, the new David Duncan House combines old and new design, preserving the integrity of the original, circa 1865 home and its Gothic Victorian design while also offering a modern approach to hospitality. Executive chef Richard Andino also evolved the restaurant’s menu to offer traditional and contemporary takes on steak and seafood. David Duncan House sits on 200 acres of land overlooking Don Mills Road in northeast Toronto. It now includes three floors of dining spaces and five private spaces. Additions include a raw bar, new outdoor patios overlooking the restaurant’s property; and a temperature-controlled wine display stocked with a selection of Old and New World wines. and The Parisian Room (80-person capacity). An award-winning hospitality and entertainment group, byPeterandPauls.com has more than 36 years experience in the industry and a diverse portfolio including event venues, restaurants, on premise catering, audio visual and DJ services, graphic design and video production, floral and decor, and gifts for life’s special moments and occasion. Its brand identities include: Hotel X Toronto by Hotel Library Collection, Petros82, Maxx’s Restaurant, Paramount, Universal, Bellagio, Savoy, The Manor, The Clubhouse, The Vue, Kortright, Black Creek Pioneer Village, S4 Entertainment and Audio/Visual, Pure Event Design, Peter & Paul’s Gifts, PeterandPauls Event Catering, YK, and Engine8 Media.